Billy the Kid tintype authenticated by Americana expert and coin dealer Kagin’s (Kagin’s). 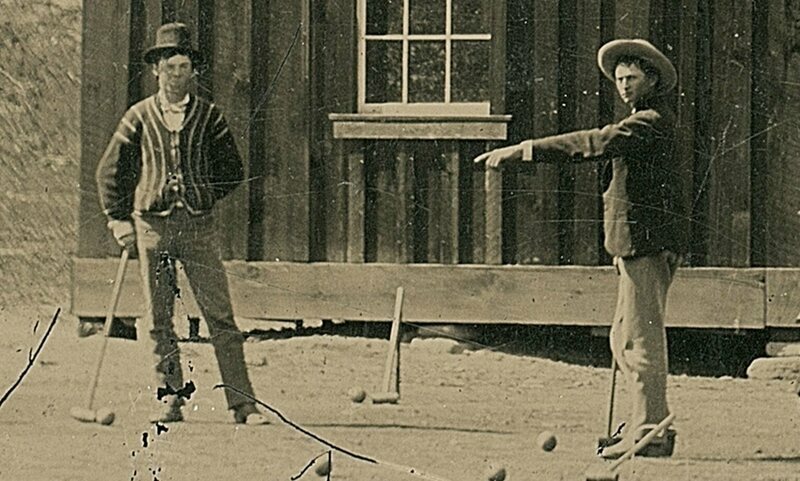 A rare coin dealer in California has concluded that a grainy image of legendary gunman Billy the Kid playing croquet is the real thing and could be worth as much as $5 million. That is not bad for a photo purchased by Randy Guijarro of Freemont, Calif. for $2 as a part of a miscellaneous lot at a Fresno junk shop in 2010, according to Kagin’s. The company is negotiating a private sale of the photo. “We have a couple of people who are interested right now,” Kagin’s senior numismatist David McCarthy told FoxNews.com said. Taken just one month after the tumultuous Lincoln County War came to an end, it offers a rare window into the lives of these gunmen. Rather than a threatening outlaw, Billy the Kid seems to be enjoying some downtime following what Kagin’s said was a wedding. 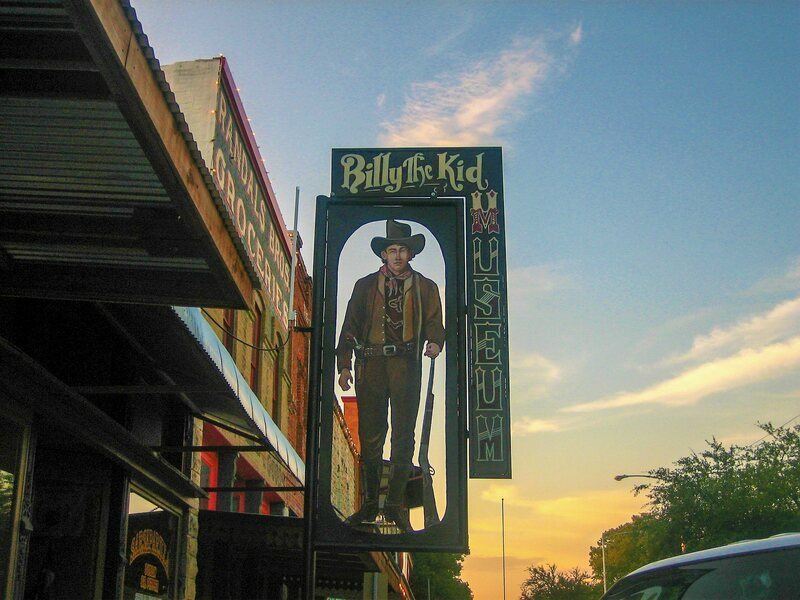 The only other known photograph of Billy the Kid is a portrait of the outlaw taken in Fort Sumner, NM in 1880. It sold for $2.3 million to Palm Beach, Fla., businessman William Koch in 2011 at Brian Lebel’s Annual Old West Show and Auction in Denver. In that photo, Billy is packing a Colt revolver and trademark 1873 Winchester carbine rifle. 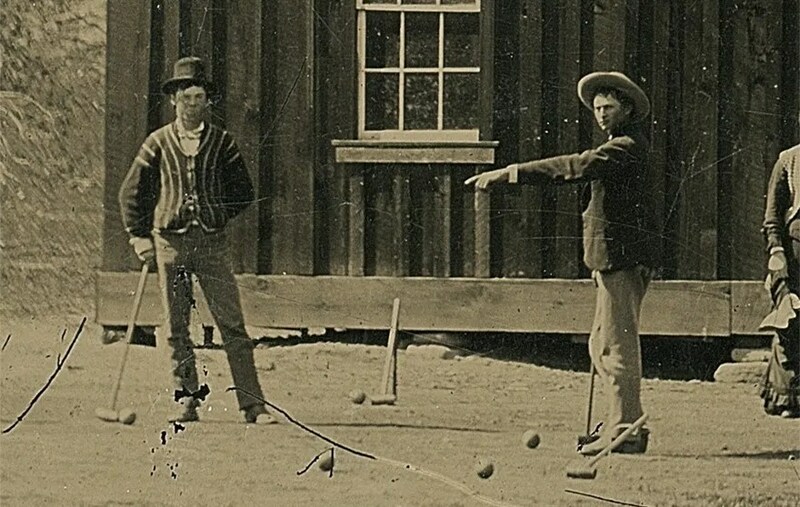 “When we first saw the photograph, we were understandably skeptical – an original Billy the Kid photo is the Holy Grail of Western Americana,” Kagin’s senior numismatist David McCarthy said, in a press release. 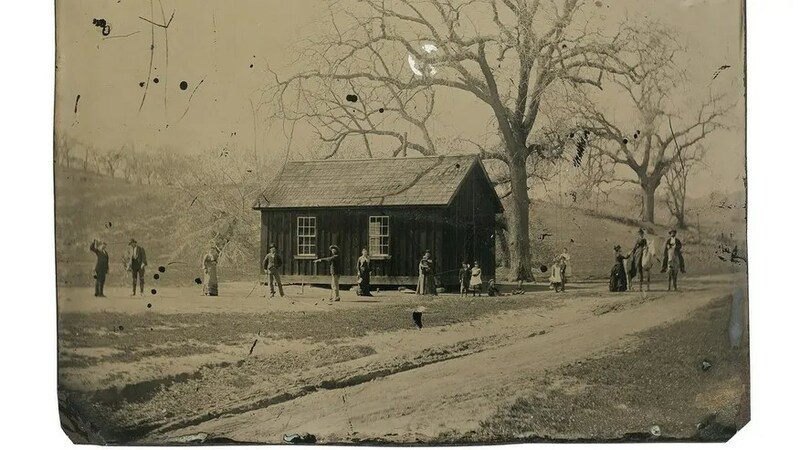 McCarthy said experts began believing the tintype was real after they were able to determine that four people in the photo – using facial recognition software – were those who spent time with Billy the Kid. Then, they began looking for events in which they were all together around that time. The cattle drive helped researchers narrow the location of the photo to New Mexico and the former ranch of one of Billy the Kid’s employers, John Tunstall. 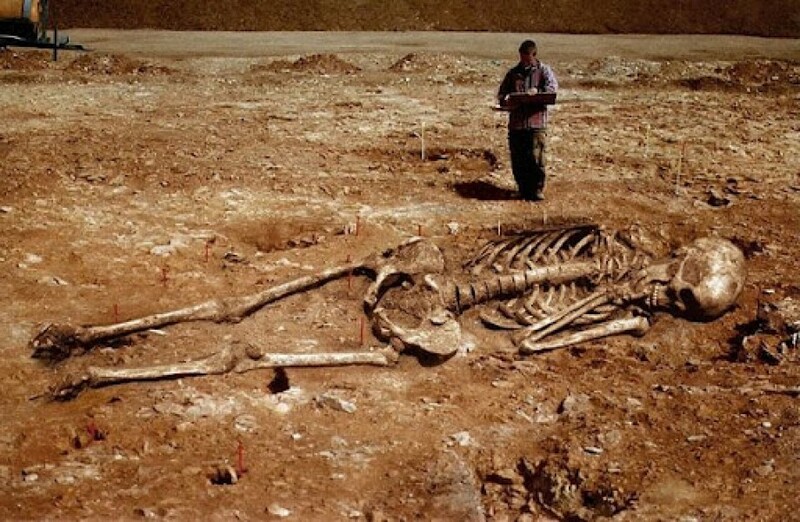 But to confirm the site of the photo, McCarthy actually flew out to the site near Roswell and examined a building that turned out to have been built “over and around” a structure that was actually in the photo. recognition, antique photography, geographic positioning, and vintage croquet sets. 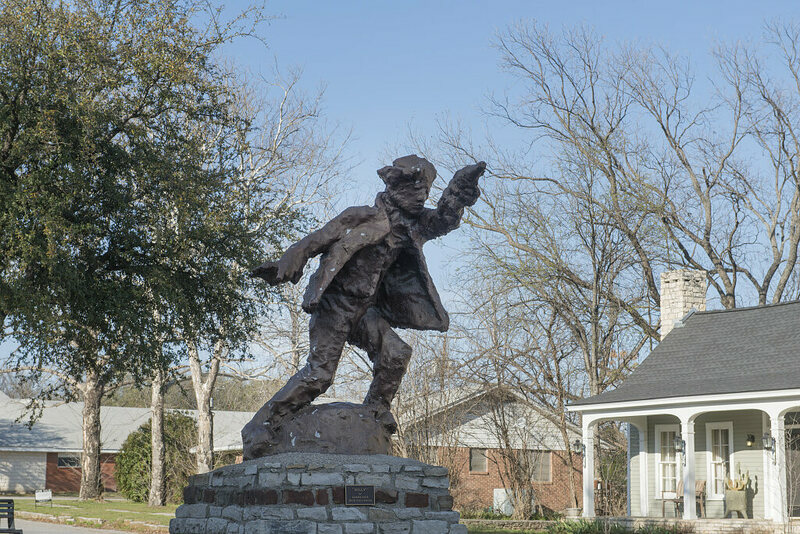 “The historical importance of a photograph of Billy the Kid alongside known members of his gang and prominent Lincoln County citizens is incalculable – this is perhaps the single most compelling piece of Western Americana that we have ever seen,” Kagin’s President Donald Kagin said, in the press release. This is the miraculous staircase of Saint Joseph at Loretto Chapel in Santa Fé, New Mexico. U.S.A., which, after 134 years since it was built in 1878, still confounds architects, engineers, and master craftsmen in the physics of its construction and remains inexplicable in view of its baffling design considerations. 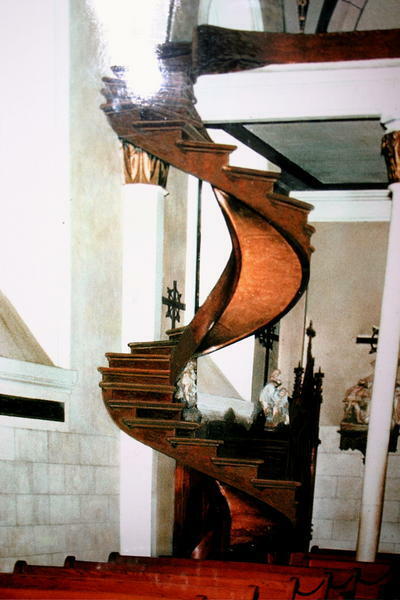 The unusual helix shaped spiral staircase has two complete 360° turns, stands 20 feet high up to the choir loft and has no newel (center pole) to support it as most circular stairways have. Its entire weight rests solely on its base and against the choir loft – a mystery that defies all laws of gravity, it should have crashed to the floor the moment anyone stepped on it, and yet it is still in use daily for over a hundred years. The risers of the 33 steps are all of the same height. Made of an apparently extinct wood species, it was constructed with only square wooden pegs without glue or nails. At the time it was built, the stairway had no banisters. These were added 10 years later in 1888 by Phillip A. Hesch at the Sisters’ request. 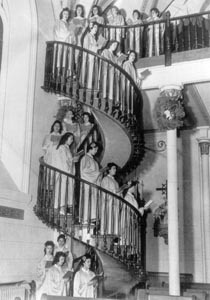 There are four mysteries that surround the spiral staircase in the Loretto Chapel: the identity of its builder; the physics of its construction which defies all laws of gravity; origin of the type of wood used which does not exist in the entire region or anywhere near it; and the staircase which has 33 steps, the age of Jesus Christ. 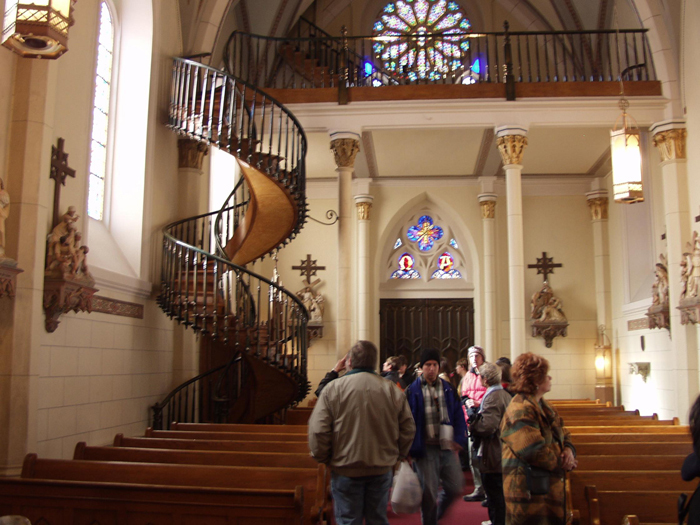 Over the years, many have flocked to the Loretto Chapel to see the Miraculous Staircase. The case had been investigated and studied. The staircase has been the subject of many articles, and re-enacted in TV specials, and movies including “Unsolved Mysteries” and the 1998 television movie entitled “The Staircase”, starring Barbara Hershey and William Petersen. According to the accounts of Mother Magdalen, Mother Superior of the Sisters of Loretto, when the Chapel was completed in 1878, there was no way to access the choir loft twenty-two feet above. Local carpenters were summoned to address the problem, but all concluded that access to the loft would have to be via ladder as a staircase would interfere with the interior space of the small Chapel. The Sisters of Loretto made a novena to Saint Joseph, the Patron Saint of Carpenters, and on the ninth and final day of prayer, a gray-haired man came to the convent on a donkey with a toolbox and approached Mother Magdalen. He asked if he might try to help the Sisters by building a stairway but he needed total privacy. Mother gave her consent gladly, and he set to work and locked himself in the chapel for three months. The only tools he had were a saw, a hammer, a T-square, and a few tubs of water for soaking the wood to make it pliable. When the staircase was completed, the carpenter disappeared without pay or thanks. The Loretto Sisters ran an advertisement in a local newspaper in search for the man but found no trace of him. They offered a reward for the identity of the man, but it was never claimed. But Mother Magdalen and her community of Sisters and students knew that the stairway was Saint Joseph’s answer to their fervent prayers. Many were convinced that the humble carpenter was none other than Saint Joseph himself, as his silent, prayerful labors were precisely the virtues one would expect of the foster-Father of Our Divine Lord. One of the most baffling things about the stairway, however, is the perfection of the curves of the stringers. The wood is spliced along the sides of the stringers with nine splices on the outside and seven on the inside, each fitted with the greatest precision. Each piece is perfectly curved. How this was done in the 1870’s by a single man with only the most primitive tools is inexplicable to modern architects. Many experts have tried to identify the wood and surmise where it came from, but no one has ever been able to give a satisfactory answer to this mystery. The treads were constantly walked on for over a hundred years since the stairway was built, but showed signs of wear only on the edges. The wood was identified as an “edge-grained fir of some sort”, but others say it is a long-leaf yellow pine, but the hard-wearing wood definitely did not come from New Mexico. Where the mysterious carpenter got this wood remains a mystery up to this day. In 1610, the Spanish Catholic conquistadors and missionaries founded La Villa Real de la Santa Fe de San Francisco de Assisi, or Royal City of the Holy Faith of St. Francis of Assisi, known today as Santa Fé, the capital of New Mexico. It was occupied by Indians, Mexicans, and Spanish and was under Spanish control until a war which placed this area under the rule of the New Republic of Mexico for 25 years. Later, as a result of the US victory in the Mexican war, this southwest area was ceded to the United States in 1848. At the end of the Old Santa Fe Trail stands the Loretto Chapel. 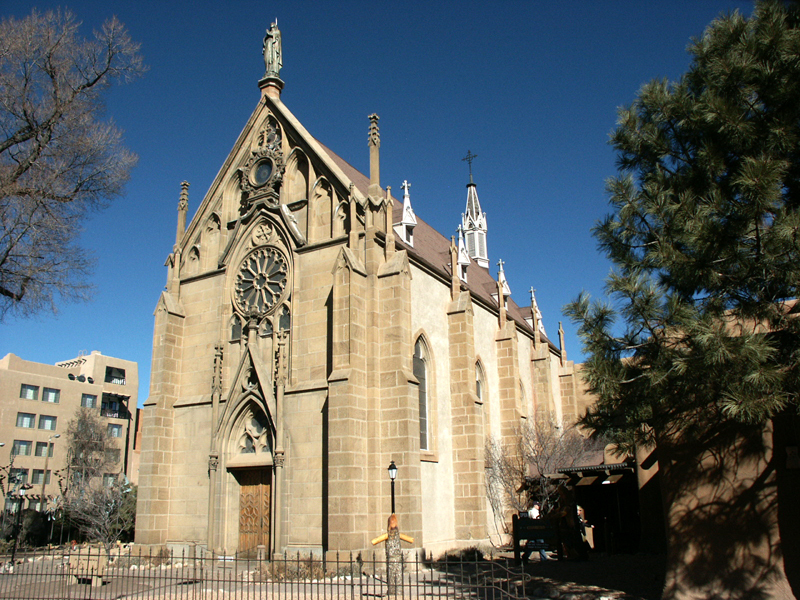 The history of the Loretto Chapel began when Bishop Jean Baptisite Lamy was appointed Vicar-Apostolic by the Church to the New Mexico Territory in 1850. Bishop Lamy, seeking to spread the Catholic faith and bring an educational system to this new territory, began a letter writing plea for priests, brothers and nuns to preach and teach. In 1852, the Sisters of Loretto responded to Lamy’s pleas and sent seven sisters and opened the Academy of Our Lady of Light (Loretto) in 1853. The campus covered a square block with 10 buildings. Through tuition’s for the girls schooling, donations, and from the sisters own inheritances from their families, they built their school and chapel. Sisters Magdalen, Catherine, Hilaria, and Roberta made up the community. At the direction of Bishop Lamy, Sister Magdalen was appointed Superior of the Sisters. It was then decided that the school needed a chapel. Property was purchased and work began on July 25, 1873, with Antoine Mouly as the architect. Mouly and his son, Projectus Mouly, were brought in by Bishop Lamy from Paris, France initially to build what is known today as the St. Francis Cathedral. Bishop Lamy encouraged the sisters to utilize the Moulys to design and build their chapel. In the early 1800s, the older Mouley had been involved in the renovation of King Louis IX’s Sainte Chapelle. It was the favorite chapel of Bishop Lamy from his early days in Paris, France. Hence, the Loretto Chapel was patterned by Mouley after the Sainte Chapelle in the Gothic Revival style, complete with spires, buttresses, and stained glass windows imported from France. It is reported that the sisters pooled their own inheritances to raise the $30,000 required to build this beautiful Gothic chapel. The Chapel was to be 25 feet by 75 feet with a height of 85 feet. Stones for the Chapel were quarried from locations around Santa Fe including Cerro Colorado, about 20 miles from Santa Fe. The ornate stained glass was purchased in 1876 from the DuBois Studio in Paris, and was first sent to New Orleans by sailing ship and then by paddle boat to St. Louis, Missouri where it was taken by covered wagon over the Old Santa Fe Trail to the Chapel. The Chapel work progressed and it was not until it was nearly finished that they realized that there was no stairway to connect the Chapel to the choir loft. Moreover, the loft was so exceptionally high that there was no longer any space for a stairway. Mother Magdalen summoned many carpenters to try to build a stairway; but each, in his turn, measured and thought and then shook his head sadly saying, “It can’t be done, Mother”. Mother Magdalen decided, “Let’s wait awhile and make a novena.” So the Sisters of Loretto made a novena to St. Joseph for a suitable solution to the problem. Then the gray-haired man came to the convent and built them the miraculous staircase. The Chapel was completed in April 25, 1878 and has since seen many additions and renovations such as the introduction of the Stations of the Cross, the Gothic altar and the frescos during the 1890s. Bishop Lamy dedicated the Chapel and named it, Chapel of Our Lady of Light. It was, in many ways, a visible symbol of the courageous Bishop’s opposition to “Americanism”, which was condemned by Pope Leo XIII in 1899. Tragically, in the devastating aftermath of Vatican Council II, religious vocations dwindled, and the Loretto “sisters” of the new post-conciliar religion, having first betrayed their Order by discarding their traditional religious garb and way of life, ended by betraying the faith and devotion of Mother Magdalen and her Sisters by selling the entire Academy grounds, including the miraculous Chapel, to a commercial property developer. Most of the historical monuments of the love for souls, zeal for the Catholic Faith, and pious devotion of Bishop Lamy, Mother Magdalen, and the Sisters who established the Loreto Academy of Our Lady of Light were demolished to make way for monuments of secular “progress” (greed and materialism) upon their ruins. Sadly, what the secular government had been unable to accomplish for almost a century, the post-Vatican II church did in a matter of a few short years. Fortunately, however, there was such an outcry from the devoted people of Santa Fe, including many of the alumni of the Academy, that the Chapel with the miraculous stairs was preserved as a national monument, albeit amidst the commercialism which surrounds it. 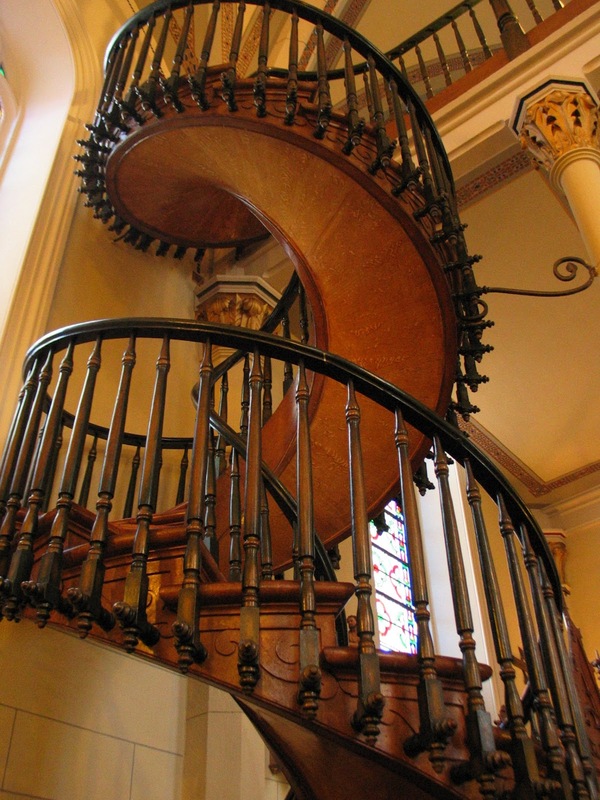 Loretto Chapel is now a private museum operated and maintained, in part, for the preservation of the Miraculous Staircase and the Chapel itself. To this very day, those who love and revere good St. Joseph, can still go and gaze upon that which is, without doubt, a visible testimony that Saint Joseph indisputably finds ways to provide for those who humbly and confidently place their needs in his capable hands. NM family says letter proves Jesse James lived to age 107…. In the realm of gun slinging outlaws, his name tops the list. Jesse James, the notorious Old West outlaw known for robbing banks and trains and killing anyone who got in his way, is alleged to have been shot by a member of his own gang on April 3, 1882. However, now 133 years after the alleged assassination, one Four Corners family is coming forward with proof that may suggest the famous outlaw lived a lot longer. “Grandpa died August 15 at 6:45 p.m.” reads the first line of the letter, written in old-timey cursive. Dated August 20, 1951, the missive could have been written about anyone. “So Jesse Woodson James at age 107 went to his death still answering questions,” the second to last paragraph fully identifies the dead relative in question. Yes, it is the famed outlaw Jesse James who is written about in this letter. Proof, says the letter’s owners, which could re-write the history books. “No doubt,” Patricia Brock said. She says they found the letter amongst love letters from her father to her mother. The letter is purported to be to Brock’s grandfather, Albert Connie, of Stanley, New Mexico and is from his cousin, O. Lee Howk, of Granbury, TX. Here’s what the history books say, after an illustrious career as a bank and train robber, the gang leader and all around bad guy , Jesse Woodson James was shot in the back of the head by gang member Bob Ford on April 3, 1882. Legend says the man was after a bounty placed on James’ head. Instead of dying that day, though, this letter claims that Jesse James lived in Granbury, Texas until the age of 107. As incredible as it may seem, a newspaper clipping from 1966 talks about the former sheriff of Hood County Texas sharing the very same details about a man’s body he examined and found to be James. The article also includes a picture, alleged to be the aging James. “I would have loved to [have] met him, but I understand he had 78 aliases,” Brock said. The family tells us that they have authenticated a signature on the envelope to be that of Jesse James, probably signed before his death. The seal of the envelope also bears three symbols, allegedly used by James when he hid treasure. “When he wrote, he printed, Jesse James did,” Brock said as to confirm the printed name on the flap. And they have authenticated the hand writing in the letter to be that of O. Lee Howk–alias of Jesse Woodson James’ grandson, Jesse Lee James III. “In Granbury, Texas I don’t know why anyone would go to that length,” Brock said. Leaving this family – who claims to be distantly related to Jesse James – excited to share this proof of his long, albeit crime-ridden, life. Grandpa died August 15th at 6:45 pm. For an old man age 107 past, he died his best. He would have lasted perhaps another year or so–questions, questions by the 10’s of thousands which he answered just simply shortened his life. I’m sorry he isn’t here to answer yours too. Frank & Jesse James made dozens of trips from Alabama, Tennessee to Texas and back. We were in Nashville, Tennessee 2 weeks in 1948. Two weeks in Atlanta, 1 week at Selma, Alabama, one week at Pensacola, one week at New Orleans. In June and part of May 1948 we were at Rye & Pueblo, Colo. Not too far from the New Mexico line. Wish you could have come up. We flew over NM twice in July 1948, crossed your state again on or about Nov. 1st 1948 & JJ came back across in March 1949 on the train. JJ went to Oklahoma twice in 1948, Chicago, Texas and on a hospital stretcher with a paralyzed rt. Side & a broken rt. hip. Could you or Shane done it even now let alone past 100 years of age? Where is Stanley? I may have some work to do out there one of these days & I would like to hear your story. So Jesse Woodson James at age 107 went to his death still answering questions-some authentic like yours. Will you please mail the clipping of the paper you save so I can add it to JJ scrap book, please? God bless you all– Jesse was buried here Sunday among friends & kinfolks–old cowboys, etc. Why do you live in New Mexico, people ask me all the time. TRUTH OR CONSEQUENCES, N.M. — Spread across 18,000 acres, Spaceport America continues to preen itself here in anticipation of booming business as the world’s first purpose-built, commercial spaceport. Anderson said she initiated the conversation with SpaceX to bring Grasshopper flight testing to Spaceport America. “We started talking, and they came out and it seemed like a great fit. We’re very excited to have them here,” she told SPACE.com. “Spaceport America offers the physical and regulatory landscape needed to complete the next phase of reusability testing, including the ability to coordinate tests to high altitudes and the flexibility to fly a variety of trajectories,” said Christina Ra, communications director for SpaceX in Hawthorne, Calif.
“Spaceport America adds a second testing location to the program,” Ra told SPACE.com via email. Spaceport America is eagerly awaiting the completion of start-up operations by Sir Richard Branson’s spaceline firm, Virgin Galactic. That company’s WhiteKnightTwo/SpaceShipTwo launch system continues to go through shakeout testing at the Mojave Air and Space Port in California. “I’ve been working on this project for more than five years now,” said Mark Butler, Virgin Galactic’s lead for the spaceport’s construction. “The flight program is going really well. With powered flight, we’re moving forward as speedily as we can, as safely as we can,” he said shortly after the June 21 launch here of an UP Aerospace suborbital rocket. “We do also have the scientific side,” Butler said. “That’s going to be a really important part of our business. We’re going to be taking experiments on board [the] spaceship and flying from Spaceport America. We are developing quite a versatile system to support this new industry. Keep an eye on the next 18 months or so, and watch one of our launches out of Spaceport America,” he added. Anderson said Virgin Galactic’s first flight out of Spaceport America depends on testing that’s currently in progress. In addition, the Gateway will house all of the company’s astronaut preparation and celebration facilities, a mission control center and a friends and family area. Additional space will be dedicated to public access via the planned New Mexico Spaceport Authority’s Visitor Experience. 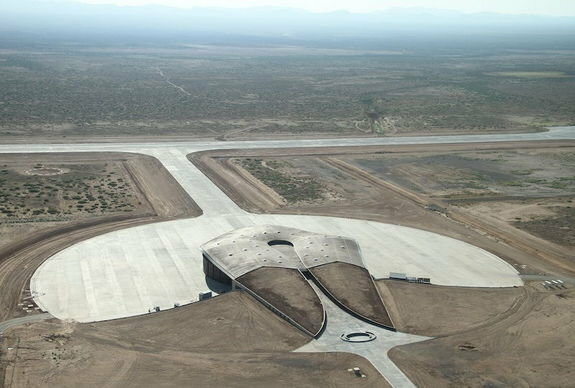 Still, the $209 million project that is New Mexico’s Spaceport America needs business. It was constructed using money from state and local county taxpayers. “I’m hoping more companies take a look at us,” Anderson said. One of the biggest challenges is to be a self-sustaining, market-driven enterprise, she added.